The return trip home was uneventful, and for that we are grateful. The workshops with Professor Makoto Fujii were highly entertaining and we learned a lot from both his lectures and his corrections.Over two days we practiced Rikka (shofutai and shimputai), Shoka (shofutai and shimputai), and Jiyuka also known as Freestyle. Professor Fujii teaches in Kyoto, at the Ikenobo Junior College and, working with young people most certainly keeps him on his toes. He is an excellent teacher, dynamic, enthusiastic and above all, a superb storyteller, which in jiyuka is essential if you are to have a successful arrangement. So he says. 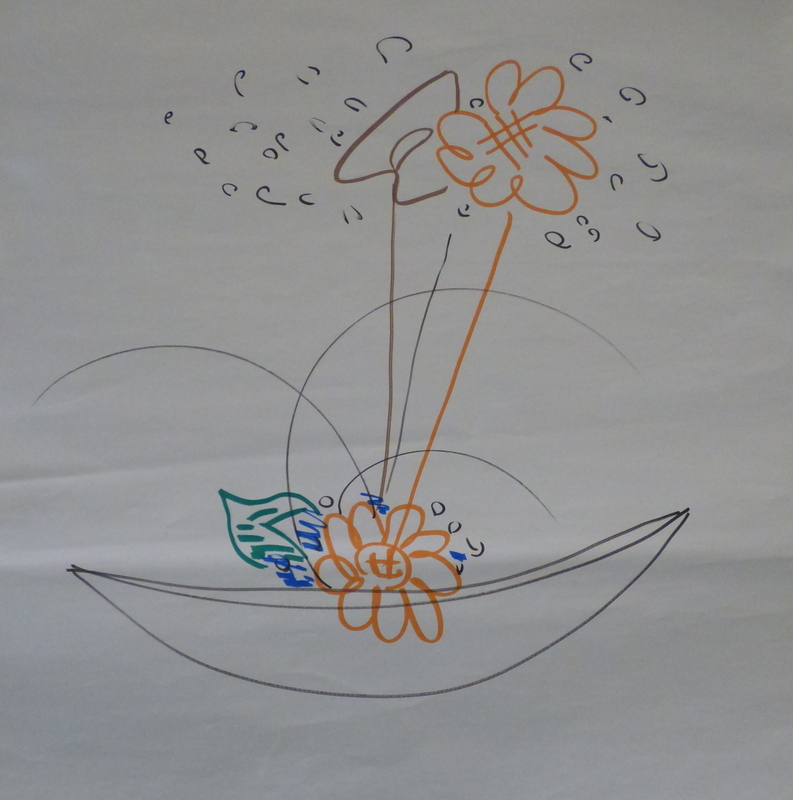 He illustrated this with his Titanic theme featuring the sunflower as Leonardo DiCaprio and the anthurium as Kate Winslet, the baby’s breath representing the wintery conditions, the steelgrass the dramatic elements, the blue and green elements for the sea, and finally, the hero sinking with the ship. 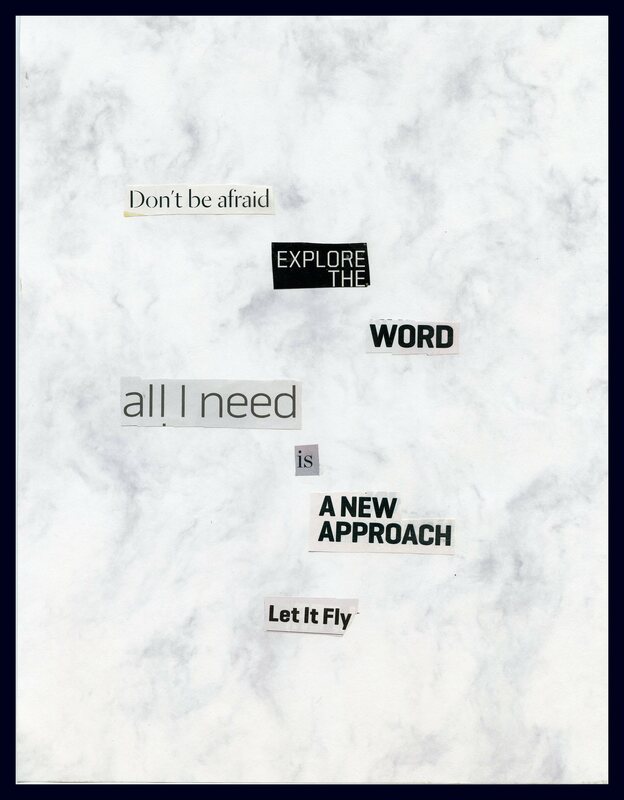 He then expected us to tell our own stories. Mine is illustrated in the above freestyle: I am the red gerbera, madly in love, and totally oblivious of the windstorm coming at me. 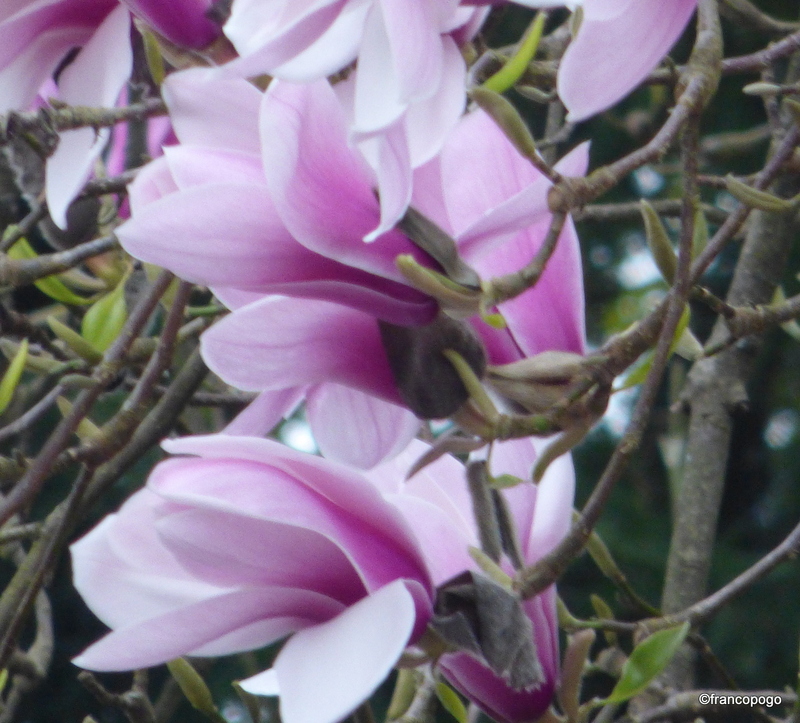 Brenda’s arrangement, on the right, represents her dream of Spring coming to Edmonton. On that first day we also arranged some shokas. The classical shoka is called shoka shofutai and goes back to the 17th century when it supplanted the rikka which was considered too large to fit in most people’s homes. The simplified arrangement invited the arranger to be one with nature, respecting the inherent quality of each plant material inasmuch as possible. In 1978, Sen’ei Ikenobo introduced the shoka shimputai or new style, simplifying the form even more to make it harmonize with the modern aesthetic and availability of new materials year round. On Sunday we studied the rikka and we had a choice between the rikka shofutai, which dates back to the 15th century, or the rikka shimputai introduced in 1999 by the Headmaster. The rikka shofutai has very strict rules or forms and is preferred by many arrangers for that very reason. In following the blueprint, you more or less know where you are going and how to get there. Many find the rikka shimputai more difficult as one has too much freedom. It is indeed difficult, but I find it quite appealing because when faced with more freedom one must arrange from the heart, and in time, perhaps, we can learn to be one with our material. And for good measure I leave you with another jiyuka by Brenda. As previously mentioned, I was invited to do an ikebana demonstration during the Hina Matsuri Festival at the Edmonton Japanese Community Association. I was also asked to provide an arrangement for the tea ceremony, such an arrangement is called Chabana, which literally translate as tea flowers. The chabana is one of the oldest styles of Japanese flower arrangements. I will provide pictures of all arrangements later on. The chabana becomes one of the focal points in the tea room. 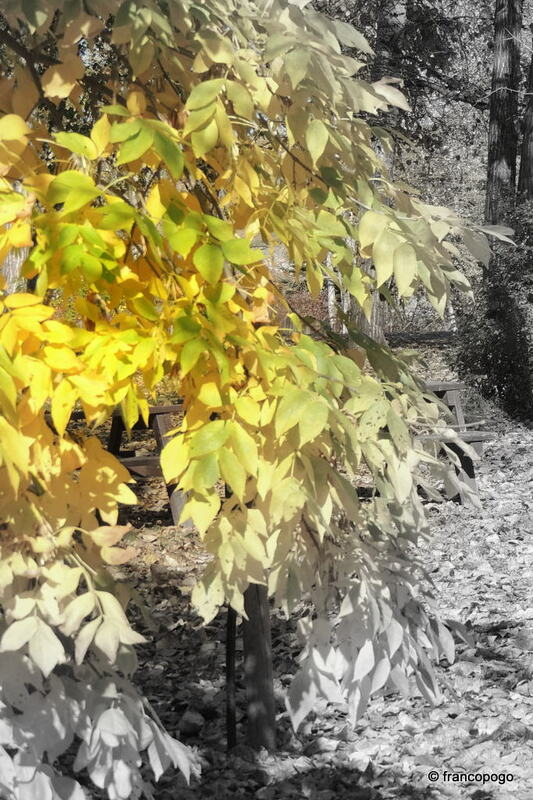 It must remain very simple, quiet, respecting the shusho, the inherent quality of the plant. It is often arranged in a basket, as I have done. See picture below. 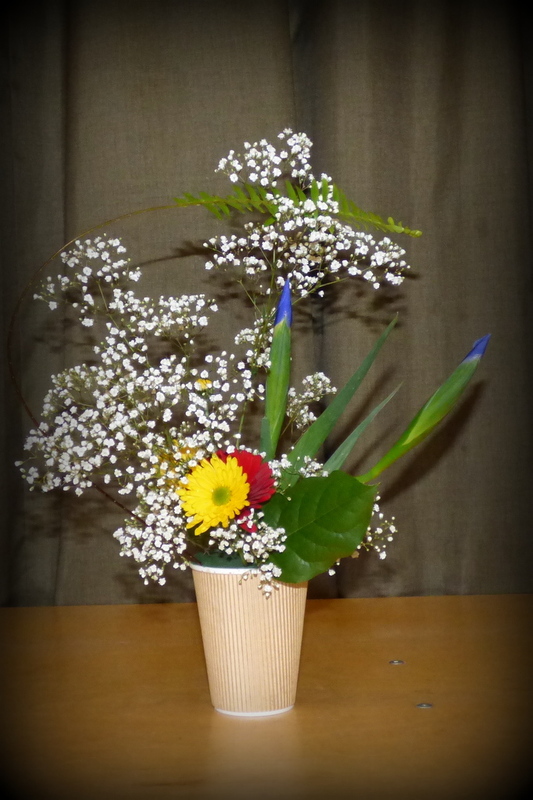 During the demonstration I wanted to give a quick overview of what ikebana could be like when arranged within the tradition of Ikenobo, the oldest school of ikebana, having been around for more than 550 years. I first arranged the classical shoka depicted above. 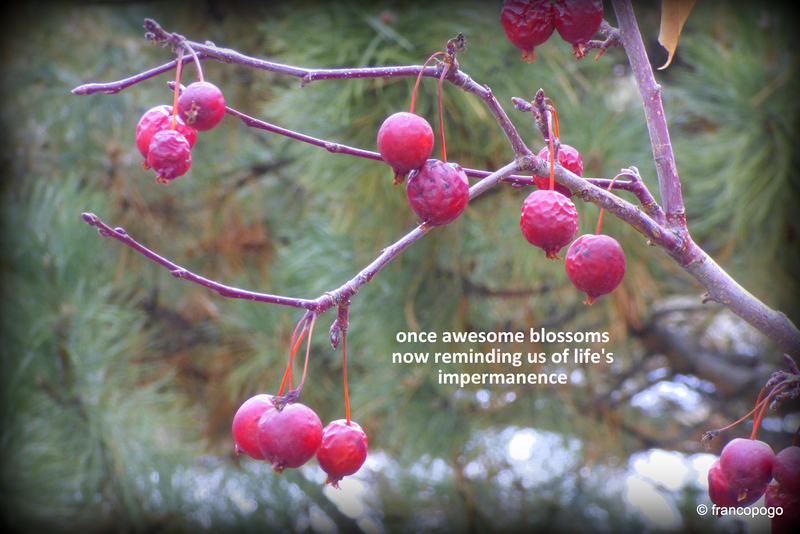 In Japan, for Hina Matsuri, plum or cherry blossoms would normally be used. I had access to pink nectarine blossoms, a most adequate substitute. Anemone are used to complete the nishuike, or two material arrangement. 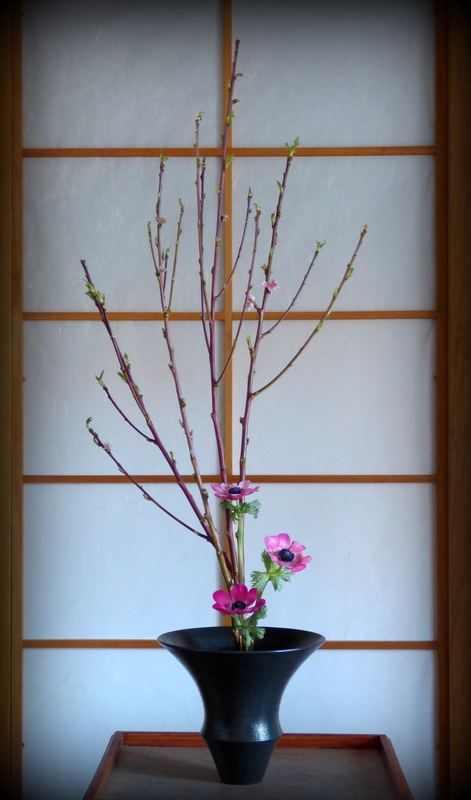 The rich pink flowers offer a dramatic complement to this classic ikebana arrangement. The second arrangement is a modern shoka called shoka shimputai, introduced in 1978 by our present Headmaster, Sen’ei Ikenobo. In this shimputai I used grevillea shrimp as my main element, the anthurium as supporting actor and the yellow freesia as complement. 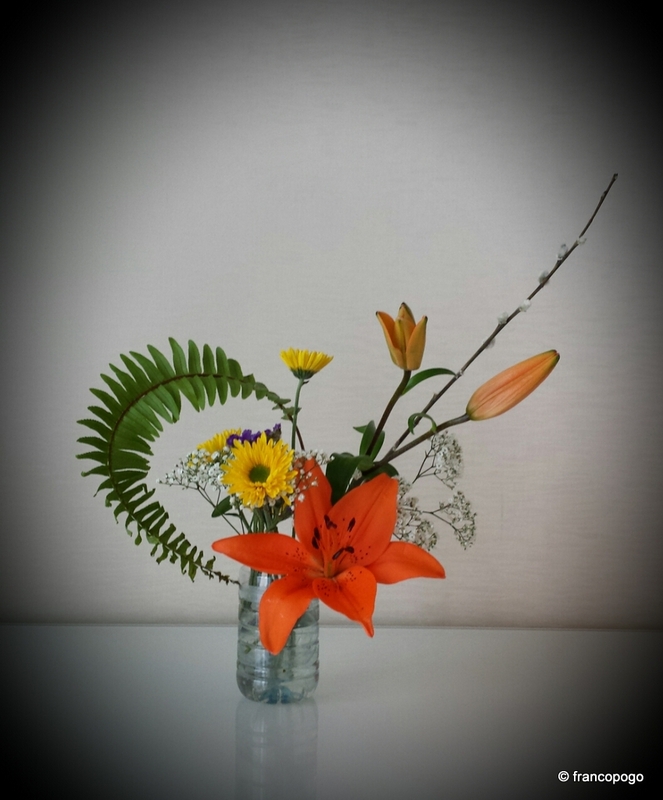 For the final arrangement, I arranged a freestyle, jiyuka, composed of fern, freesia and grevillea. 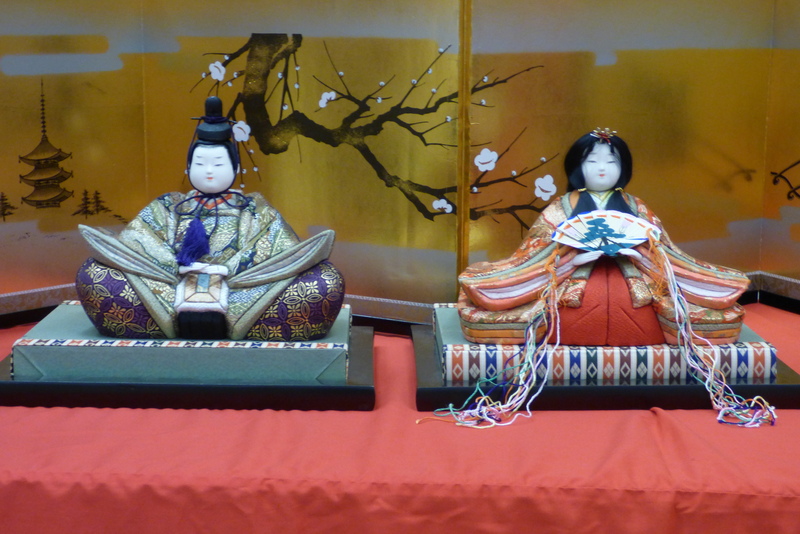 On Saturday, March 14, the Edmonton Japanese Community Association held it’s annual Hina Matsuri celebration. The Hina Matsuri is the Dolls’ Festival also known as Girls’ Day in Japan. I have written on this subject, in detail, in a previous post, two years ago. This year, the event was expanded to include a number of activities. After visitors had had the opportunity to view the doll exhibition, they were invited to experience the tea ceremony as practiced by members of the Matsukaze Tea Ceremony Group. 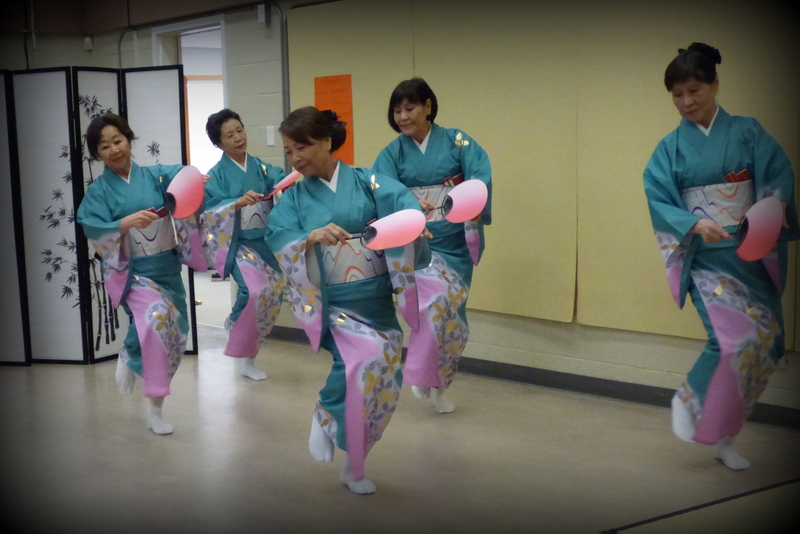 Afterward the audience was entertained by members of the Awa Odori Club who performed a variety of colourful Japanese folk dances, sometimes as a group, other times in two’s or solo. Their performance was highly appreciated by all present. As this was the first time I saw the group in action, I will be looking forward to their next public appearance. 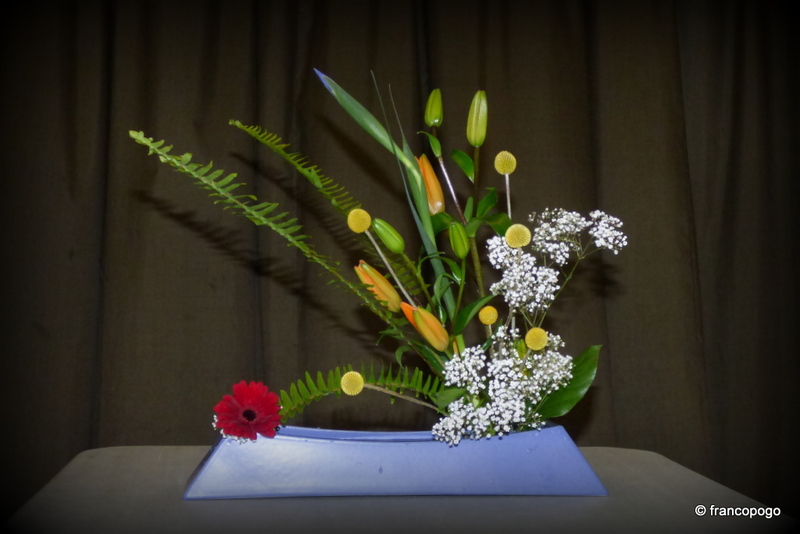 As teacher of the EJCA Ikebana Club, I gladly accepted the invitation to demonstrate Japanese flower arranging as part of this festival, but more about that tomorrow.